Unique System LLC (USA), a division of Unique Maritime Group (UMG) which is one of the world’s leading integrated turnkey subsea and offshore solution providers, has successfully completed the first mobilization of its Unique Hydra purpose-built Hyperbaric Reception Facility (HRF) within the Gulf of Mexico region of the United States. Unique System LLC (USA) is based in New Iberia, Louisiana and Houston, Texas. It specializes in the supply of equipment for sale and rental to the diving and offshore industries in the Gulf of Mexico region. From New Iberia, Louisiana, the company offers commercial diving equipment rentals and sales, saturation diving systems, decompression chambers, new builds, refurbishments, project management and mining & construction tunnel boring machine airlocks. From Houston, Texas, its specialization embraces hydrographic survey equipment rental and sales. The HRF was transported to Pensacola in the state of Florida, set up and completed various procedures including IMCA testing and subsequent customer approval. The system was leased by Cal Dive International for the duration of its project in order to insure the safety of its saturation divers in the event of an emergency while on the project. The testing of the unit and fit up and test of the SPHL to the unit were successfully completed in the last week of August. HRF units are used in the diving industry to insure that, in the event of an emergency evacuation of a DSV having divers in saturation, the divers will have availability of more controlled and comfortable decompression and medical treatment. 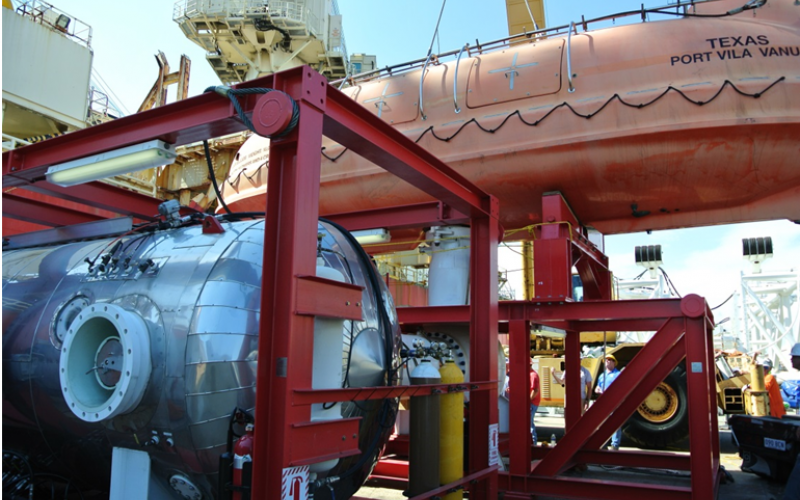 Their HRC or SPHL after launch can be transported to the HRF which is set up at a shore facility where monitoring and decompression of the divers can be safely completed.